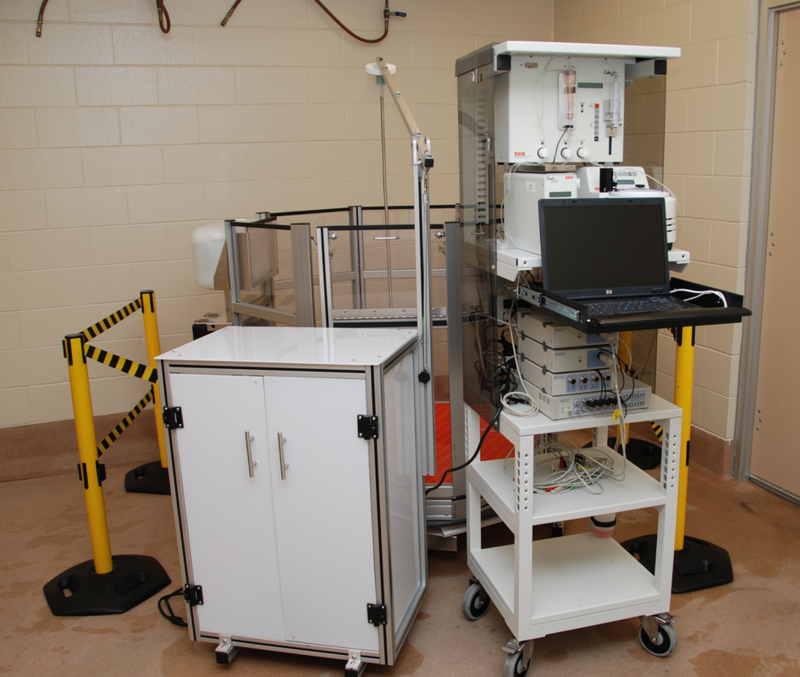 The lab was involved in a collaborative study with BioAnalytical Systems, Inc., to develop a penning system (the PigTurn™) that enables us to collect blood samples remotely, whilst monitoring behavior. The basic idea is that as the pig walks around the pen, the pen rotates in the opposite direction, ensuring that its catheter does not get twisted. Blood samples can be taken every 6 minutes using BASi's automatic sampling Culex system, which removes the need to restrain the animal to take the sample. The effect of this is illustrated by the graph to the right. When a pig is manually restrained and sampled by jugular venipuncture, we have a blood norepinephrine level of around 700 pg/ml (yellow line). With automatic sampling, average nor-epinephrine levels average around 250 pg/ml, regardless of whether pigs are being manually restrained and sampled simultaneously in the same room (blue line) or not (green line). This shows that the manual sampling is extremely stressful in itself. We have received Phase II NIH funding under the SBIR scheme to continue the system's development to include remote sensing of heart rate, ECG, blood pressure and core body temperature and also to incorporate elements to enrich the environmental. We see potential application of this system in the animal welfare field to improve our ability to quantify an individual's stress response to an imposed stressor (e.g. heat stress, chronic noise stress, etc.) with any effect of response to the human sampler removed. This is extremely important for the refinement of our data and to further our understanding of pigs' responses to specific stressors in a non-confounded manner. Shelly DeBoer also investigated ways to add environmental enrichment into the system and investigating whether the enrichments effect pig welfare and physiology. Initial results show that the addition of a rubber mat and a mirror work to decrease plasma cortisol concentrations – a classical physiological indicator of stress. This multidisciplinary project was carried out in collaboration with BioAnalytical Systems Inc., Dr. Lee Matthews (Purdue) and Dr. Greg Knipp (Purdue). DeBoer, S.P., Garner, J.P., Lay Jr., D.C., Eicher, S.D., Lucas, J.R. and Marchant-Forde, J.N. (2013) Does the presence of a human effect the preference of enrichment items in young isolated pigs? Applied Animal Behaviour Science, 143: 96-103.